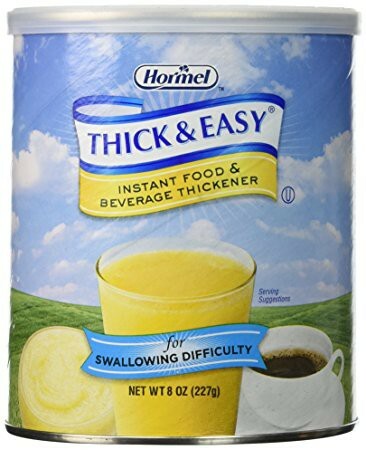 Hormel Thick & Easy Instant Food Thickener makes food and beverages safer for swallowing. They are designed to assist patients with dysphagia and swallowing disorders. 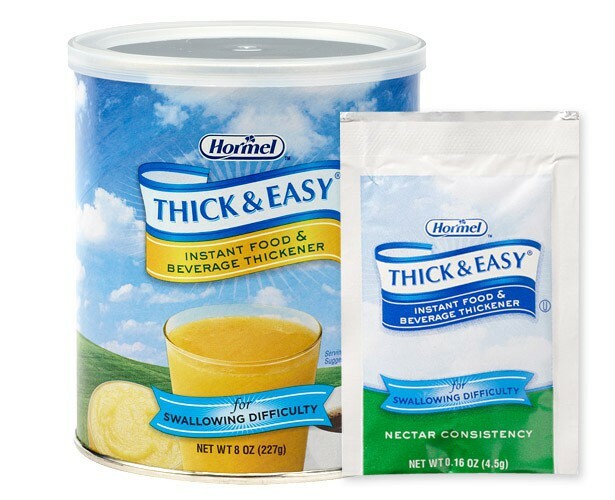 Manufactured by Hormel Health Labs, Thick & Easy Thickeners are versatile, allowing all types of hot and cold foods, liquids and supplement drinks to be thickened without affecting the taste. Food and drinks achieve proper consistency for safe swallowing within one minute of mixing. Dysphagia patients can enjoy tasty and nourishing foods while maintaining a properly hydrated and healthy nutritional status. 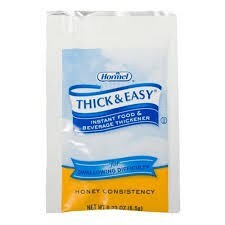 Below is a summary of each Hormel Health Labs Thick & Easy Instant Food and Beverage Thickener product. 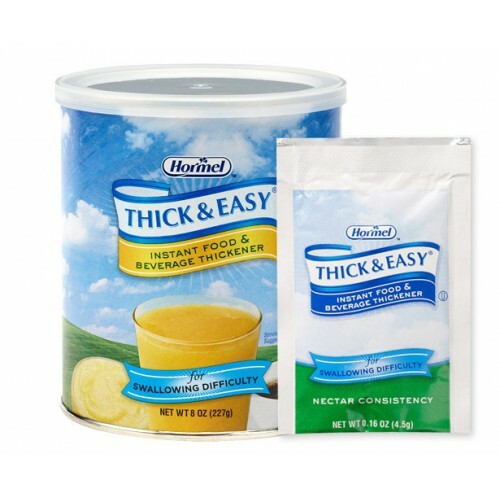 Thick & Easy Starch Thickeners provide an optimal blend of thickeners to create a clear, lump free dispersion of food or drink. 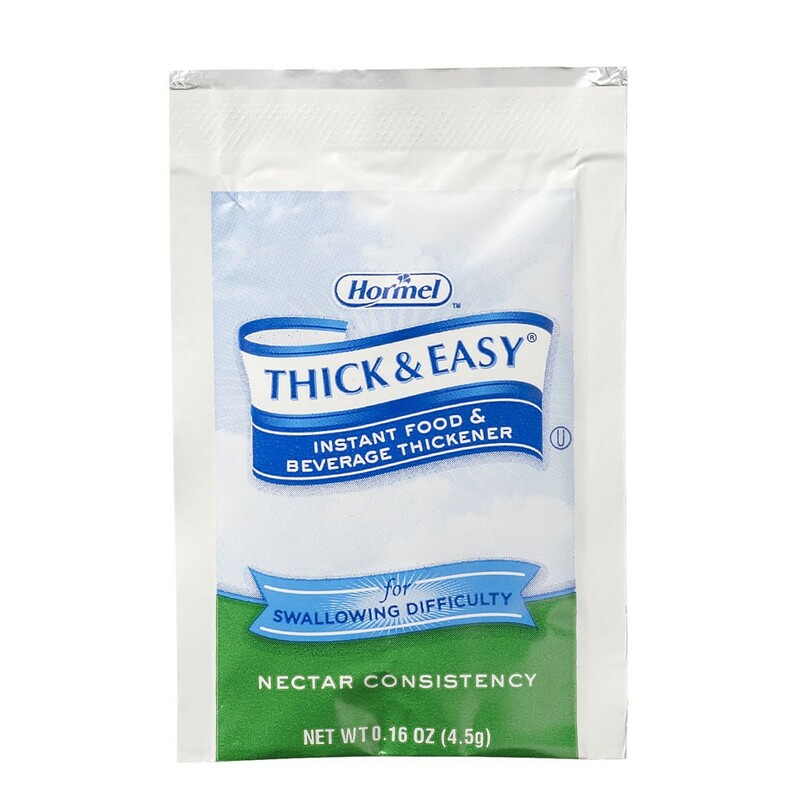 This Instant Thickener has a limited calorie and carbohydrate content to make it suitable and adaptable to a variety of diets. It's a formulation is specifically designed to thicken supplement drinks. Blends with food or beverage quickly and smoothly. Stops thickening after one minute. 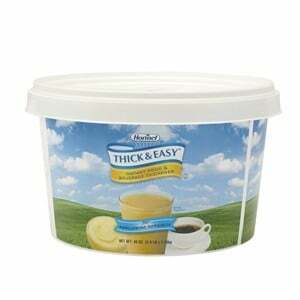 Retains consistency for shelf life of food or liquid. Provides appetizing plate presentation with little effort. Releases 98% of available fluid after consumption. Product Numbers: 07941, 20223, 21929, 17938, 66132, 72451, 72453. Size Options: 4 Gram, 4.5 Gram, 6.5 Gram, 4.12 Ounce, 8 Ounce, 30 Ounce, 2.5 Pound. Calories Per Serving (serving size 1 TBSP): 15. Shelf Life: 2 to 5 years unopened. Thickens all my beverages, hot or cold. No lumpy globs to ruin your drink.